Care has been taken to ensure the figures below are accurate, but mistakes are quite possible, particularly for journey times as these are complicated to calculate and are sometimes subjective in how they are calculated. The main winners from the changes are passengers from outer suburban stations like Penrith, Campbelltown, Hornsby, or Sutherland, who will enjoy shorter journeys into the CBD. A number of lines – such as the Inner West, South, Western, and Illawarra Lines – will have their stopping patterns significantly simplified, making them easier to understand and less susceptible to delays or disruptions. The new stopping patterns are more likely to be clockface in nature (e.g. stopping every 10 or 15 minutes, rather than some other erratic or uneven stopping pattern). The Cumberland Line is being reinstated in both directions all day, with half hourly services between Campbelltown and Blacktown. There are 2 additional trains per hour on the East Hills, Northern, and Bankstown Lines, plus 1 additional train per hour on the North Shore Line. 4 express services from Parramatta now continue through to Epping via Macquarie Park rather than terminating somewhere on the North Shore Line, providing additional services for the Epping to Macquarie Line. Though the timetable was re-written from the ground up, there are very few losers out of it. Those that do lose out tend to be those stations now skipped to speed up other services, but in most cases this is made up for by more even headways or shorter journey times. So much so, that in some cases, even the stations that would be classified as losers come out ahead. 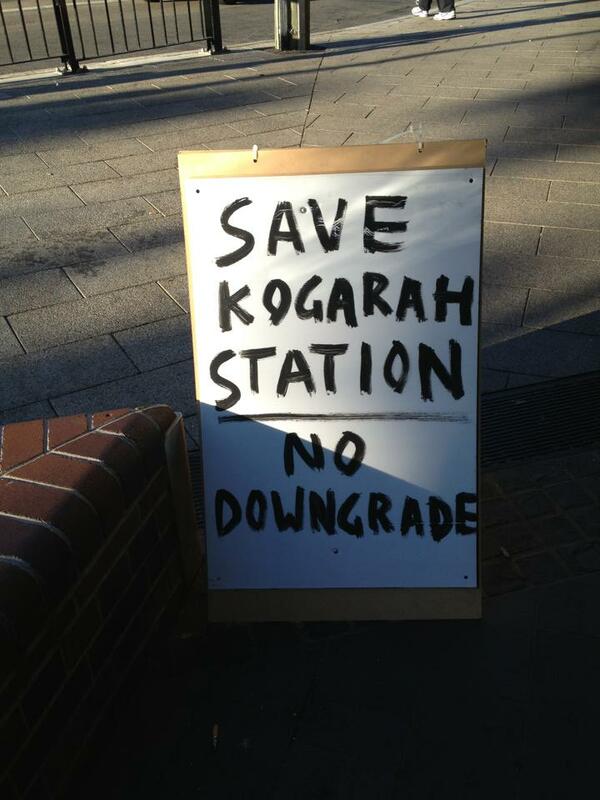 The stations that have the most legitimate qualms are Kograh and Rockdale, which lose half their services. More on this at the bottom of this post. Estimated overcrowding levels are shown below based on the additional services being added (Source: Our Performance, Cityrail). The maximum loads figure has been removed, as this is difficult to estimate, and is likely to drop due to better spacing between trains. There are 2 additional trains from Bondi Junction (and a third which starts at Martin Place) which were formerly Sydney Terminal starting South Coast Line services. Meanwhile, the additional Northern Line services are both 4 car trains, which is the equivalent of a single 8 car train. As a result, the number of trains for this line has only been increased from 4 to 5. The very overcrowded Northern Line (143%), Bankstown Line (134%), and Airport & East Hills Line (127%) should all see overcrowding drop to a more manageable 114%, 101%, and 109% respectively. Meanwhile, additional services on the North Shore Line (99%) and Eastern Suburbs Line (61%) will bring overcrowding on these down to 94% and 54% respectively. The loads for the Inner West and South Lines have been merged, given the uncertainty of what the changed stopping patterns on these two lines will achieve. Overcrowding may also be impacted by indirect effects. For example, faster trains from Hornsby to Central via the North Shore could shift passengers away from the Northern Line and towards the North Shore Line. Some passengers at Strathfield or Homebush may opt to take one of the new Northern Line services and passengers on the Bankstown Line may take a train via Bankstown rather than Lidcombe once direct services via Lidcombe end, thus freeing up space on the Inner West Line, South Line, and/or Western Line. These could provide much needed relief to the Western Line. However, there does not appear to be any immediate relief available for the Illawarra Line, even though the line currently runs a maximum of 18 trains per hour, which is 2 below the current maximum of 20. The AM peak is (roughly) all trains that arrive at Central Station between 8:00AM and 9:00AM each weekday morning. This has sometimes been shifted forward or back if the busiest period for that particular line is slightly different. The 2 exceptions to the above are Macquarie Park bound services from the CBD and Parramatta bound services between Blacktown and Harris Park. In these cases, it’s trains arriving at Macquarie Park and Parramatta Stations between 8:00AM and 9:00AM. Frequency refers to the number of trains that stop at that station during that hour. It indicates the total capacity of the line, in terms of seats and standing room. Headways refers to the time between trains at that station (and not the time between them when they arrive at Central). The important figure is the maximum headways, as it shows how long the wait is to the next train can be if you just missed the train. Journey time indicates whether journeys are longer, shorter, or the same, and by how long. This can sometimes be subjective, so use it as a rough guide. Green means better (e.g. 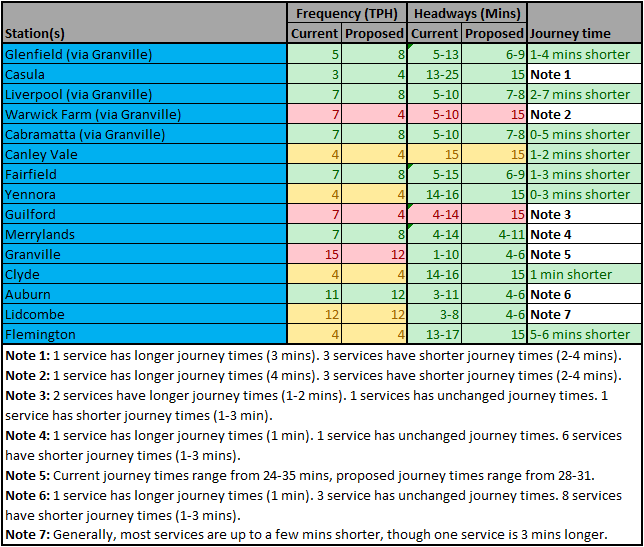 shorter journey times, higher frequency, shorter max headways), yellow means unchanged, red means worse. Two additional services per hour are added in the morning peak, starting from East Hills, which run a limited stops service to Central via the Airport Line. The additional services have reduced headways for many stations. This, along with the completion of the Kingsgrove to Revesby Quadruplication, has allowed express and limited stop services from Campbelltown to skip more stations and reach the CBD more quickly. Revesby does lose 2 services per hour, but those that it retains are now faster and more evenly spread out. So overall it’s still a small net gain for Revesby Station users. Two additional services per hour via Bankstown are added in the morning peak, replacing the Inner West Line services, which now start and end at Homebush rather than Liverpool. The two additional services are fast express services, which skip a number of stations. 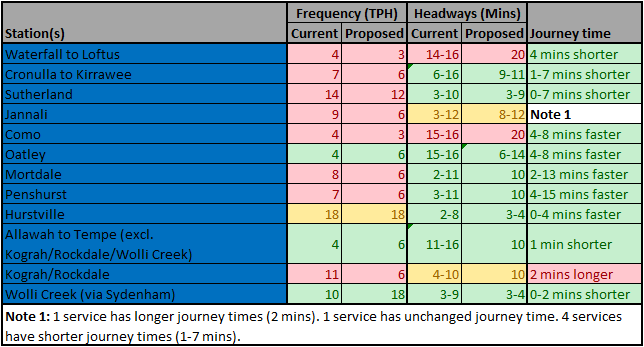 All stations (bar Yagoona) benefit from smaller or more predictable headways between trains, and many see an increase of 2 trains per hour, while Marrickville and St Peters are the big winners with a doubling of their services from 4 to 8 trains per hour. Journeys are now faster, particularly for Carramar to Sefton, whose journeys will be up to 5 minutes faster. The biggest losers here are Berela and Regents Park, who lose direct services to the CBD via Lidcombe. This means either changing train at Lidcombe or going the long way round via Bankstown, which adds an extra 5-10 or 20 minutes respectively to journeys. The Inner West Line goes from 5 to 4 trains per hour, losing one of its peak hour services. The good news is that all Inner West Line services will now start as empty trains from Homebush, rather than Bankstown or Liverpool, which should translate to more available seats for Inner West passengers. The line will enjoy a single stopping pattern (down from the existing 3), which should improve predictability/reliability, simplicity, and results in a more even spread of services. For example, passengers at Lewisham, Petersham, and Macdonaldtown Stations currently wait as long as 20 minutes between some trains, and this will drop to 15 minutes even though fewer trains will now stop at these stations. With the possible exception of Summer Hill, the combination of extra seats and more evenly spaced services means that all stations on this line are likely to benefit from the new timetable. The South Line gets an additional service, going from 7 to 8 trains per hour. It also sees a reduction in its stopping patterns, falling from 5 to 2 – one all stops and one limited stops. Excluding one fast train, the South Line will also see faster journeys virtually across the board, as well as lower and more even headways thanks to a more harmonised stopping pattern. 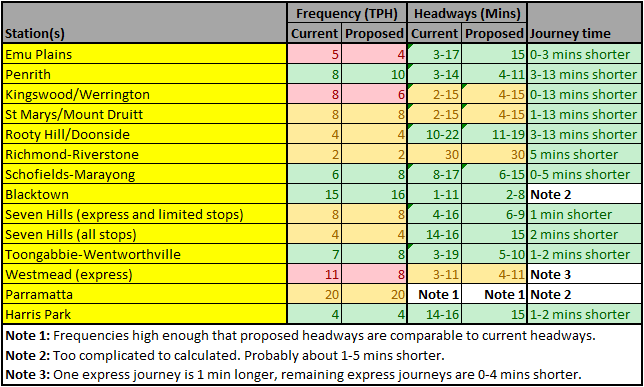 The biggest improvement on headways is Casula, whose maximum headways drop from 25 minutes to 15 minutes, while Liverpool services will be 2 to 7 minutes faster. Warwick Farm and Guilford lose out from the new stopping patterns, while Granville also sees fewer trains due to more Western Line services now skipping it. However, while the former 2 also see a deterioration in their maximum headways, Granville will enjoy more evenly spaced out trains. The North Shore Line gains an additional service, starting from Gordon, which brings the number of trains per hour up to 19, just shy of the current maximum of 20. Stopping patterns have been simplified, dropping from 5 to 6, and part of this change means more trains will start from Hornsby. The combination of these two improvements mean drops in maximum headways at almost every station, particularly Asquith, Hornsby, Wollstonecraft (incorrectly spelt above), and Waverton. Trains on the North Shore Line will now skip more station on the upper North Shore, which will shorten journey lengths for those from the outer suburbs around Hornsby. The biggest winners are passengers from Hornsby, who can now travel to the CBD via Gordon as quickly as they currently can via Strathfield, which should free up capacity on the currently congested Northern Line. The losers here are the stations that lose some services: Wahroonga, Warawee, Pymble, Turramurra, Roseville, Linfield, Killara. 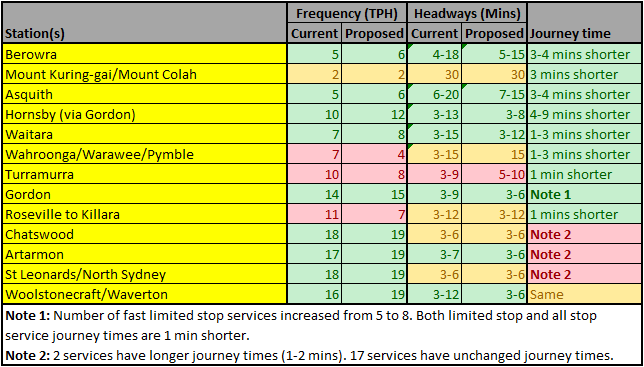 The simplified stopping pattern means that maximum headways remain about the same, but concerns have been raised about whether there remains sufficient capacity given the urban consolidation in the Upper North Shore in recent years. The Northern Line gains 6 additional services, 2 running limited stops between Epping and Sydney Terminal, aswell as 4 from the CBD to Epping via Macquarie Park. The former will help to ease overcrowding on the Northern Line, while the latter has reduced headways between Chatswood and Epping from the current 15 minutes to a maximum of 10 minutes. Space for the 2 additional Sydney Terminal terminators has been freed up by having the 3 South Coast Line services continue through to Bondi Junction rather than terminating at Sydney Terminal. There aren’t really any losers on this line. Previous rumours that trains on the Northern Line would all terminate at Sydney Terminal and require passengers to transfer to another train did not eventuate. The Western Line’s stopping patterns have been massively simplified, down from 14 currently to a proposed 8 (and that includes Cumberland trains, which are not counted above as they do not continue into the CBD). The simpler stopping patterns also mean lower maximum headways, such as at Toongabbie, Pendle Hill, and Wentworthville (almost halved, from 19 to 10 minutes) or Seven Hills (down from 16 minutes to 9 minutes). Trains on the Western Line will now stop at fewer stations, which should result in shorter journeys, as much as 13 minutes shorter for stations between Penrith and Blacktown. However, station skipping means that Kingswood, Werrington, and Westmead will lose 2 to 3 trains per hour. Despite this, the simplified stopping patterns means that maximum headways will remain unchanged, and many remaining services will be faster. The return of all day Cumberland Line services between Campbelltown and Blacktown in both directions raised the possibility of improved services to Parramatta for those stations nearby. However, despite the increases in service frequency, maximum headways have remained roughly the same, while journey times are unaffected. This is a lost opportunity. Stopping patterns here have been reduced from 8 to 5, which creates a simpler and more reliable timetable. Maximum headways have fallen for most stations, though increased slightly for Como and stations South of Sutherland. Services South of Hustville will now run express to Central after reaching Hurstville, while the number of services starting at Hurstville will be doubled from 3 to 6 and run all stops to the Central. The result is significantly shorter journeys for passengers at a station South of Hurstville, as well as improved services for passengers at stations North of Hurstville other than Kograh and Rockdale. 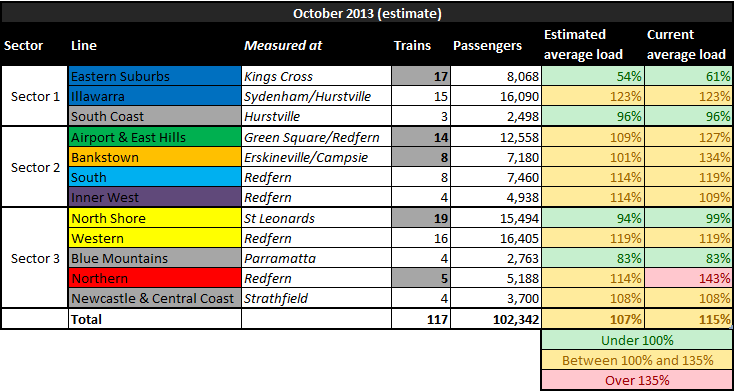 Kograh and Rockdale lose all their express services and also see a drop in total services from 11 down to 8. These changes are easily the most controversial ones in this new timetable. These two stations are in the top 20 most heavily used out of the 176 suburban stations in the suburban network, with Kograh in particular being both an origin and destination station. Not only that, but it removes direct services to these stations from anywhere South of Hurstville during peak hour. The thinking behind the decision seems to be due to crowd distribution, as passengers at Kograh and Rockdale board already full express services rather than relatively empty all stations services. This generally saves passengers around 3 minutes, but increases dwell times at CBD stations, which then leads to delays which affect all trains on that line. If this causes a delay of 3 minutes or more, then it wipes out the time saving for Rockdale and Kograh passengers, while delaying all others on that line. It would appear that those who drafted the timetable have decided that preventing such delays would lead to a better network, and that means putting the interests of all the passengers who do not use these two stations ahead of those who do. How much shorter is the shortest central-to-Wollongong journey? Good analysis though, I can see how many changes make sense. Any change of analysis of the newcastle/central coast line as well? This is a bizarre statement. The congested part of the Northern Line are the low-frequency all-stops suburban services between Epping and North Strathfield, which is not a service which you can catch from Hornsby. Services to the CBD from Hornsby via Macquarie Park are not congested at all. The fastest services from Hornsby to Central will still be some of the Central Coast and Newcastle line services operating via Strathfield, and they will still be the fastest ( at least for passengers actually going to Central ), and still faster than the North Shore Line suburban services from Hornsby. Umm, well, no. They all stop at Wolli Creek and Redfern and most of them stop at Sydenham also. You would have to wonder, how many people from the Shire want to go to Kogarah, and how many want to go to Wolli Creek or Sydenham. Mich – The reason they stop at Wolli creek, Sydenham and Redfern is because they are junction stations, you don’t necessarily leave at that station, but change to another train going elsewhere. Excellent analysis. Cumberland Line services, although increased in frequency although “petering out” after 6.30pm, will be the domain of non-airconditioned, 4 car “S” sets. This will still mean chronic overcrowding on services towards Parramatta in the morning and in the afternoon, where loadings at Parramatta on services between 4.45pm and 5.45pm is nothing more than a barging exercise to get a seat. I would have thought the opportunity to cascade down redundant carriages displaced by the introduction of newer stock was there to be taken and give some relief to peak hour services. Is the expense of maintenance of an extra two carriages on a couple of “diagrams” that work through Parramatta at peak times that high? Another missed opportunity. So Those people who live Between Carramar and Berala wanting to travel to the Inner West or Northern Lines will now need to catch a minimum of 3 trains to reach their destination. So if you want to go from say Chester Hill to Macquarie Park you would need to catch 5 trains to travel the most direct route (Which is a condition of travel for calculating fares). Even if you went the longer way Via Cabramatta/ Granville you would still to catch 4 trains. People who would want to access Strathfield, Burwood, Ashfield, Newtown would be the biggest losers. This section of line (Carramar – Sefton) has had services cut by 50% during the Weekday off peak, late nights and weekends since 2002 and now according to the final draft timetable we will only get 2 trains per hour all day with only two or three extra services in the afternoon peak. (Carramar – Sefton) to the City. Where is the logic in having less trains stop at Westmead?Are you trying to discourage mountains people from commuting to work by train. Just a reminder that at Westmead we have Westmead adult Hospital, Westmead campus of the Sydney Childrens Hospital Network, Cumberland Hospital , Westmead private Hospital and major school and university campus. Many hospital staff commute to work on early trains that currently stop at Westmead to avoid driving and trying to access very limited parking . Many of our patients and their families and visitors commute by train for appointments juggling prams, walking sticks , toddlers and crutches. As a Mountain commuter and on behalf of patients and families I am disgusted by the proposal that less trains will stop at Westmead . As a Beverly Hills resident, I (and many, many others) are at a loss at how our currently crowded peak hour limited stop services and the less popular ‘via airport’ services are being improved by removing all of the limited stop services. It seems like someone has not realised just how many people there are on the train. We have lost half of our ‘peak hour’ services, full stop. Wyong, Gosford and Woy Woy passengers who have to start work at 7am and 7.30am have real difficulties with no direct North Shore Line until 6.34am. There has been little thought given to the huge number of commuters that start travelling from that area from 5.30am at present. We have lost our main commuting links for early morning starts. I agree with mich. The combined weight of people getting off at Sydenham and Wolli Creek for either interchange or to exit the station is likely to be far less than those getting off at Kogarah. Be interesting to see stats on it though – it may vary by time of day. the people of VILLAWOOD, CHESTER HILL, SEFTON, REGENTS PARK AND BERALA HAVE BEEN DUDDED THE WORST. How do we get to Newtown now! change twice!